Ovanes Mikoyan, son of the famous creator of the Soviet MiG jets, aircraft builder and adviser to director of the Structural Engineering Centre of the Mikoyan Design Bureau said in an interview with Moskovsky Komsomolets, that the future of aviation is in drones. Russia is developing a series of unmanned aerial vehicles (UAVs). Active work in this area began in 2008, when the conflict with Georgia showed a need for reconnaissance and combat drones, and the Soviet Pchyola (Bee) and Reys (Flight) no longer met modern battlefield needs. “This theme (of UAVs) must be developed,” said Ovanes Mikoyan, son of the famous creator of the Soviet MiG aircraft. “A pilot need not be always sent to the front line. It is enough to have an operator on the ground, who can fly a drone to the destination, and perform almost all the same tasks as a pilot, albeit a little worse than now, but with lower losses,” said Mikoyan, also an aircraft designer and adviser to the Structural Engineering Centre of the Mikoyan Design Bureau. In Russia, according to Mikoyan, “all and sundry” are working on the development of drones, with the Mikoyan Design Bureau having its own projects as well. “We have lots of ideas at the Design Bureau. The important thing is that the state provides support. Then the future will not be only in the company that bears my father’s name, but in the overall Russian aviation industry,” said Mikoyan. It is worth noting that the MiG Design Bureau, together with Klimov OJSC, presented the concept of a full-sized model of a stealth jet-powered UAV – the Skat, back in 2007, during the MAKS-2007 Air show. 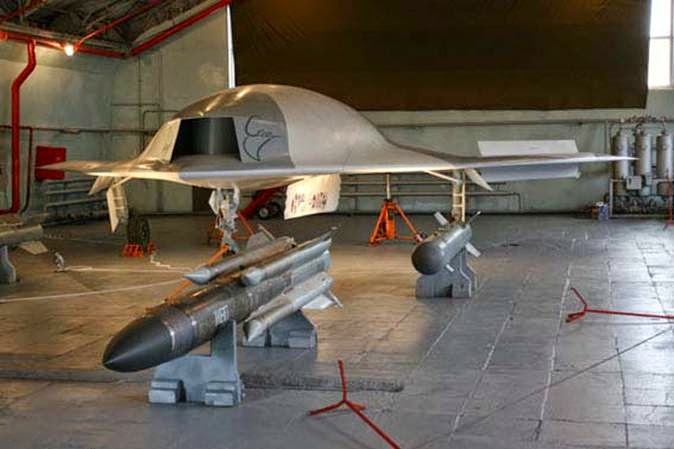 Despite its promising features, (maximum takeoff weight of 10 tons, and practical range of 4000 m), stealth, and consequently ultramodern appearance (vaguely reminiscent of the American carrier-based UAV X-47B, it was first presented to the public in 2008) this program was soon cancelled. Instead, in July 2012, the “overpowering” Sukhoi was officially declared the developer of a heavy UAV, with a take-off weight of 10 to 20 tons, after a closed tender floated by the Ministry of Defence. In October 2012, the companies Sukhoi and MiG (both design bureaus being part of the United Aircraft Corporation, led then by Sukhoi’s Mikhail Pogosyan) signed a cooperation agreement for the development of UAVs. Thus, the MiG will be taking part in this project, the tender for which was earlier won by Sukhoi. According to reports, the results of the collaboration may be ready by 2018. Earlier, Pogosyan had announced that the future UAV would be using systems and solutions common to the fifth-generation fighter jet – the T-50. The Ministry of Defence had allocated 5 billion rubles for the development of Russian UAVs but, by 2010, there were no tangible results. Then, to assist the domestic defence industry, Russia purchased Israeli UAVs, the IAI Searcher Mk II and IAI Bird Eye 400, made in Russia from assembly kits called Forpost (Outpost) and Zastava (Frontier Post), respectively. The Transas Company (St. Petersburg) and Sokol Design Bureau (Kazan) have been involved in the creation of long-endurance drones since 2011. Their work is continuing. Earlier this year, it became apparent that a prototype-demonstration UAV – the Altius-M (Altair) - would be test flown before the end of 2015. The “Russian equivalent of the Predator” – the Dozor-600, which, according to combat performance characteristics, is similar to the American prototype, but since this data was unproven, the unit remains at an experimental stage. Currently, in addition to the Israeli aircraft, the Russian Defence Ministry uses short-range UAVs – the Orlan-10 and the portable Grusha (Pear). Recent reports suggest that Russian paratroopers have been training with the portable UAV – the Iskatel (Seeker). There has, however, been no confirmation that these have entered service with the armed forces.